Nar Phu Valley Trek is an incredible journey into the wild and unexplored vicinity at the north of Annapurna. Nar Phu Valley Trek is a rugged and a wild trek. 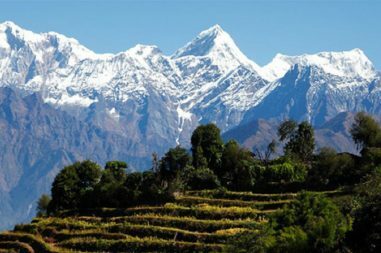 The journey takes you to the magnificent two villages of the Annapurna region Nar and Phu. The major attraction of this trekking in Nepal is the tranquility and traditions along with the amazing Himalayan environment. A fantastic way to observe the local culture and religious practices of ethnic communities such as Lama, Gurung and Ghale, this trek takes you to the Kang-La Pass and Thorong-La Pass along Manang and Mustang districts giving you the opportunity to explore the Bhotia villages, remnants of the ruined forts of the Khampa settlement (the place which Khampa refugees from Tibet once captured and lived) along with the old Buddhist monastery listed out of the 108 world’s great Buddhist monasteries and also said to have been the last monastery constructed by Karmapa Rinpoche –Tashi Lakhang Monastery. The trek begins informally with sightseeing in Kathmandu but the actual trek begins from Jagat. You will be following the popular trekking routes of Annapurna Circuit Trail gradually. Branching off from Koto to follow the off-the-beat track to Nar Phu Valley in the north of Manang. Furthermore, if you wish to travel full of spirituality then choose the package with the responsible tourism team of Bharal Adventure Pvt. Ltd.
Off the beaten trekking trail of the Nepal often provides the unexplored and untouched civilization. Through Nar Phu Valley trek you can continue the Annapurna Circuit Trek or reach the trail of the Jomsom Muktinath trekking as well. Bharal Adventure Pvt. Ltd. offers this isolated alternative Annapurna region trekking in Nepal at the most competitive price. Therefore, Bharal Adventure assures you best hospitality and quality services. Upon the arrival at the Tribhuvan International Airport in Kathmandu, the guests will be greeted by a representative from Bharal Adventure who will take them to their hotel for checking in. The guests will be treated with a savory authentic Nepali cuisine for dinner in the evening. After breakfast, guests will set off to a guided tour to four of the UNESCO World Heritage Sites in Kathmandu, Kathmandu Durbar Square – ancient palace of the then kings of Nepal, Hindu temple Pashupatinath, and Buddhist stupas Swayambhunath – The Monkey Temple, and Boudhanath. Pre-trip discussion shall be arranged between the participants and team leaders and crew members at noon. As we finish our breakfast, we start the long drive that will take us to Jagat from Kathmandu via Besishahar up to where the picturesque view and smooth black-topped road will make the journey easy, however, as we move ahead from Beshishahar, the dustry and coarse road gives us bumpy rides during which our only compensation is the scenic views visible from the windowpane of the dust covered vehicle. The trek begins just after breakfast descending down the trail until the arrival of the river from where the trail continues through a lush green forest. From here, further ascent leading to sharp-edged cliff facing the riverbank will take us through Chyamje to a suspension bridge after crossing which we begin the climb to steep and slippery and physically challenging trail to Sattale. Treading along a succession of rock-strewn trails, we descend to a grassy riverbank leading to Tal from where the path becomes rugged and winding as we approach the steep forested village of Karte. We cross a suspension bridge meandering along the waterfalls and cliffs as we arrive at Dharapani. The morning trek towards Bagarchhap takes about an hour to reach through pine and fir forests. After visiting the white washed monastery in the village, we continue our trek till we reach Danaque, which takes about an hour, from where we follow the steep ascend up to Timang before continuing through pine forests again until we reach Latamarang that takes about an hour and half. Taking lunch break here, we proceed through the forests as we come close to Koto village where we stay for the night. We resister our restricted area permit at the Police Check Post as we trek through the river bank of Soti Khola passing through pine forests, streams and suspension bridge until we reach Dharmasala from where we continue trekking through forests and then ascend steeply towards Meta village. Traversing up and down and across suspension bridges for about four hours will take us to Kyang where we can observe the remnants, particularly the ruined forts of the Khampa settlement (the place which Khampa refugees from Tibet once captured and lived). Further walk along the rocky trail for about three to four hours after passing through Phu Khola will take us to Phu Gaon (village). This day is scheduled for acclimatization for which we shall explore the culture, natural diversity and religious practices of the ethnic groups like Lama, Gurung and Ghale residing in this lost/hidden valley. We can also explore how people here make their survival depending upon agriculture, animal husbandry and seasonal migrations. We can also visit Tashi Lakhang Monastery – the old Buddhist monastery listed out of the 108 world’s great Buddhist monasteries. It is also considered to be the last monastery constructed by Karmapa Rinpoche. Descending across many streams and suspension bridges, we reach Mahendra Pul after about four hours. As we pass the high suspension bridge 80m over the Gorge of Lapche River, we stop at the bridge for lunch after which, we ascend through the steep trail passing many Buddhist stupas until we arrive at Nar village after about two hours. Several Buddhist monasteries coupled with the backdrop of Pisang Peak and other small peaks welcomes us as we enter the Nar village. The second day set aside for acclimatization, we spend it hiking nearby and exploring the Nar village trying to observe local culture and lifestyle as we prepare for the trek next day. Waking up early in the morning, we have our breakfast as we get ourselves prepared for the long hike of the day. We begin our trek to Kang-La Pass after breakfast, where we stop to take pleasure in the mesmerizing view of Annapurna massif before descending down to Ngwal where we will spend the night. Passing through the isolated village of Paugh overlooking the amazing views of Annapurna range, we leave Ngwal. As we ascend gently uphill to Mungli, we go further to the main trail of Annapurna Trail from where we head towards Manang. Crossing a stream, we climb to the village of Tenki above Manang and continue ascending to the Marshyangdi Valley turning northwest up the valley of Jarsang Khola. Following the trail northward and passing a few pastures and a crumb of juniper trees, we ascend steadily as we come closer to the village of Ghunsa, a cluster of flat mud roofs just below the trailhead. From here, we go through meadows used as grazing land for horses and yaks. Crossing a small river on a wooden bridge, we pass an ancient Mani wall in a pleasant meadow as we reach another small village of Yak Kharka literally meaning “grazing land of yaks”. Making our way to the foot of the pass, Thorong Phedi, we begin our trek just after breakfast. Thorong Phedi is a small but busy settlement catering to the needs of tired trekkers and climbers used mostly as a base camp. Although some trekkers attempt to hike to the High Camp on this day, we do not recommend so as we believe this would be too hectic for the trekkers and also, they need to get sound sleep and rest on this day so that they could be prepared for their tough hike on the next day. We come to another exciting part of the trek as we cross the grueling Thorong-La Pass resting at a dizzying height of 5,416m/17,764 ft. The trek begins early morning so as to enable us to pass through the icy-high altitude trail during the day and it is by sunset that we reach Muktinath, a holy pilgrimage for both Hindus and Buddhists. 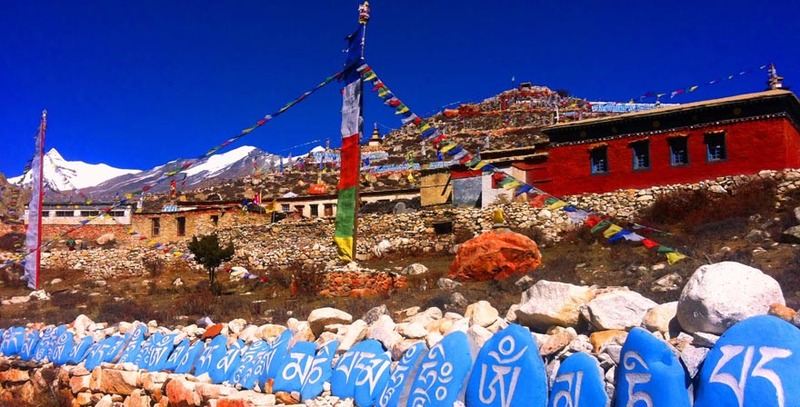 One of the most popular destinations for Hindus and Buddhists pilgrimage, Muktinath is also considered as “Muktikshetra” by the Hindus, meaning the “place of liberation or salvation”. After the temple visit and exploration of the area, we begin descending down the Kali Gandaki Gorge through the arid land passing through Jharkot and Khingar village rich with Tibetan architecture. We follow the valley floor most of the way sprawled along the banks of Kali Gandaki as we descend down to Jomsom. On this day, the guests shall exchange photos, emails and pleasantries during and after breakfast before being escorted to the airport by a representative of Bharal Adventure approximately three hours before their scheduled flight.